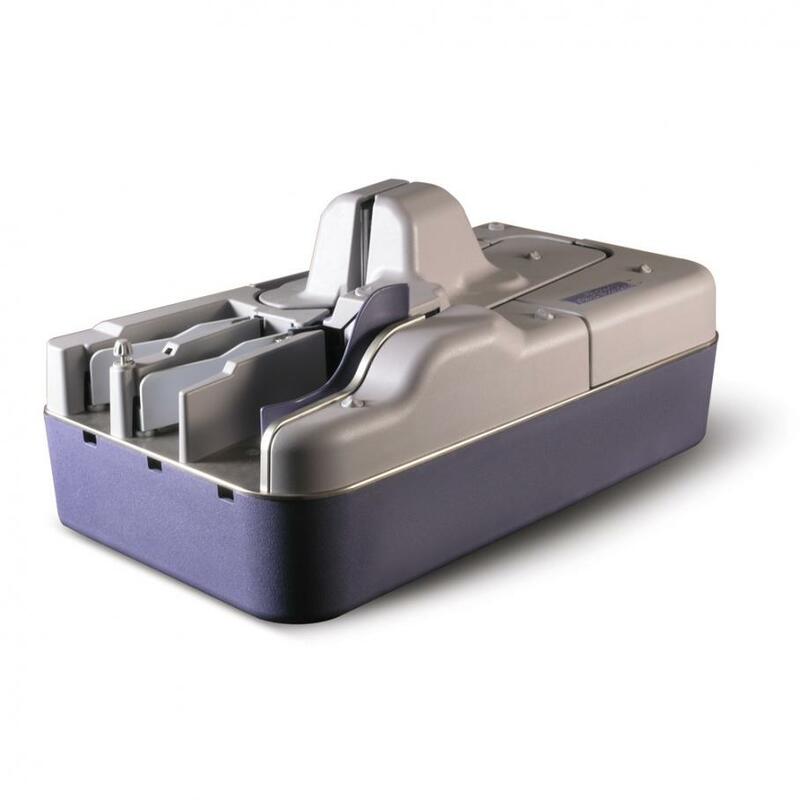 The Seac Banche SB 4100 is suitable for data capture and document imaging requirements based on checks and financial documents such as credit transfer slips, travellers cheques, utility bills and other vouchers. 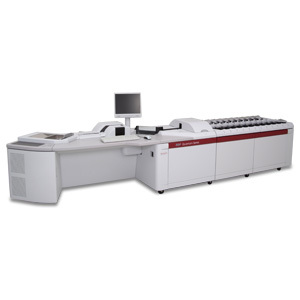 This peripheral unit combines the complete document processing capabilities of the internationally successful RDS 3000 reader scanner with the high throughput and capacity of a small reader sorter, within a much smaller footprint. These features make it ideal for a daily workload of several thousand documents in back-office applications, with an attractive price/performance ratio and surprising versatility. The SB 4100 is equipped with three sorting pockets. 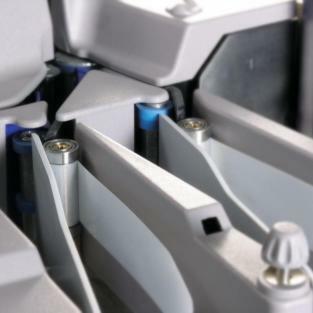 The processed documents can be sorted into two pockets with a capacity of about 200 documents each, motorised to prevent paper jams and equipped with pocket-full sensors. A smaller pocket, with a capacity of about 25 documents, can be used for rejects. The sorting criteria are set by the application. Depending on processing requirements and document size, the basic SB 4100 can achieve a throughput up to 100 documents per minute, while the enhanced version SB 4500 can double the performance reaching up to 200 dpm. 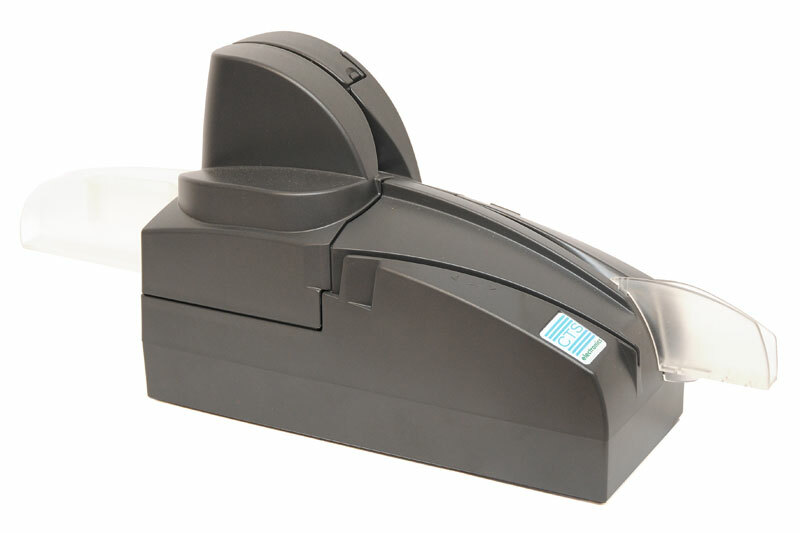 Physical dimensions 19.5 x 10.4 x 9.4 "
The autofeeder can hold up to 400 standard documents, and more documents may be added to the feeder without interrupting the flow. 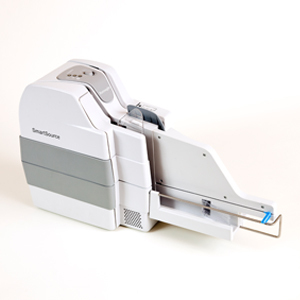 To ensure that only one document enters the paper path at a time, the double feeding control (transparency check) works with two photosensors at different heights, located immediately after the feeder. If mixed or 'critical' types of documents are processed, an Adaptive Ultrasound double feed sensor is also available as an option, allowing an even higher degree of effectiveness. The unit's MICR reading functionality decodes both CMC7 and E13B magnetic codelines. Reliability of the system is undisputed, based on the experience of thousands of Seac Banche codeline readers installed worldwide. The proprietary onboard decoding system for OCR documents (optional) can read OCR-A, OCR-B and E13B codelines and mixed font OCR-B X E13B (UK Bank Giro), with outstanding accuracy and reliability. The OCR system can also be used for barcode reading. 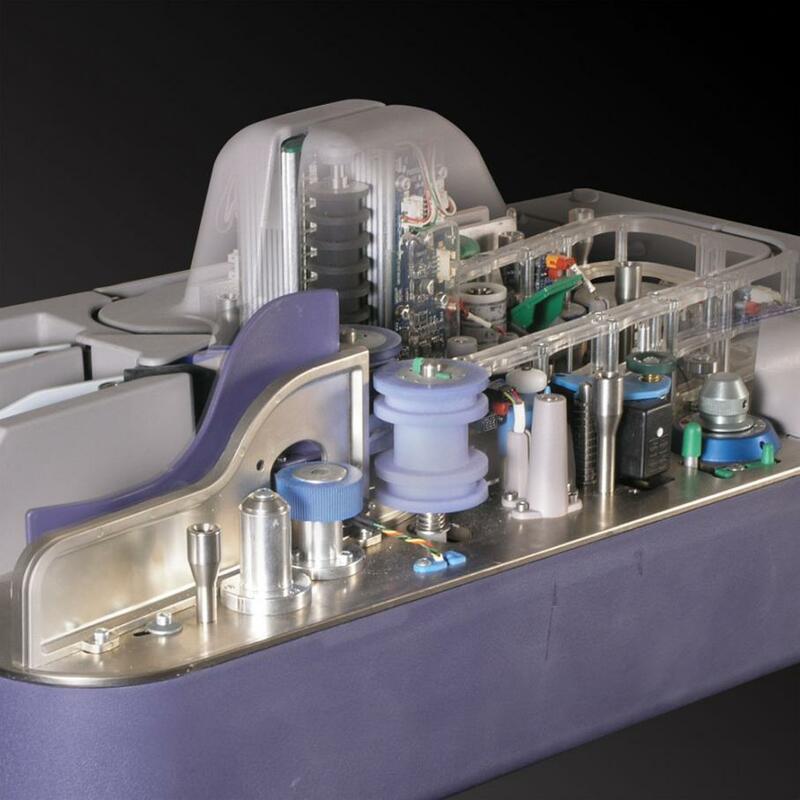 The SB 4100 uses the same advanced imaging technology that has defined the success of the Seac Banche RDS 3000. Images captured by the SB 4100 are perfectly clear and sharply defined. At standard speed (433 mm/sec), the system allows for up to three separate images of a document to be captured in a single pass. Images are scanned under program control and can be used to provide input to OCR/ICR character recognition systems, allowing for the acquisition of reliable and accurate data, or displayed for visual verification or manual key entry, as well as stored for archive and retrieval. Resolution can be selected via application software, independently for front and rear images - 200 x 200 dpi or 100 x 100 dpi, 256 shades of grey, green or red light source (the latter showing red dropout images). An enhanced version - the SB 4100 - captures front and rear images in full colour, without losing the ability to capture greyscale images.  The images can be compressed by DLL functions in several formats, according to user needs. The programmable inkjet endorser can print a variable string of data on the rear side of the document, up to full document width. 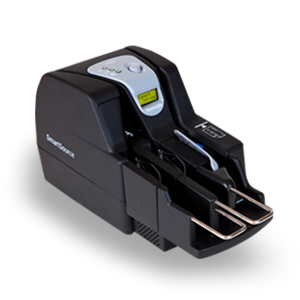 The optional roll-on stamp can be factory installed to stamp either the front or rear of documents: the pad can be personalised by the user, and it is automatically inked before each stamping action by an inking roller. Voiding and endorsing are controlled by the application.